Ok, why do I need to know about open spaces in my chimney? All I want to know, is the chimney is safe to use. Well that’s a valid question to ask, but it does require a little understanding of what your chimney does. Remember smoke, heated gases and some sparks use the chimney for a passageway from your fireplace or appliance to the great outdoors. Having gaps in between the liners could put yourself or your home in harms way by letting these things escape! Let’s look at this closely. If you have a chimney liner that has 7”x7” interior dimensions and a 1/16th inch gap between the next liner, the open area equals 3 sq. inches. Place 9 more liners on top of this, with the same 1/16th of an inch opening, collectively you have 30.38 sq. inches. This is larger than a 6” hole. So that “not so bad mortar joint”, may not be serving you or your chimney very well. In an another example, let’s ramp it up a little by taking a 13” x13” liner, which is common for a fireplace chimney. Consider a one inch gap between the liners, which is not uncommon. We have 52 Sq. inch open area in one liner joint area. That’s larger than an 8” hole. Add 4 more liners to the top of this one and you have a whopping 260” sq. inch opening, larger than a 18” round hole. Chimneys operate under a negative pressure or vacuum, so how can we expect the chimney or fireplace to operate with gaps? If this was your vacuum cleaner you would notice if it wasn’t working well. Consider this example chimney in newer home construction or renovation of an older home. This could become a real problem in performance and energy efficiency. Tighter homes compete for air so who is going to lose the battle for make up air? Your Chimney! Even though there may be a brick or block to surround the liners, it will still leak air into the chimney. This can contribute to the summertime damp/smoky odor you may experience from time to time. ﻿There are national recommendations from the building codes concerning this issue. Even though the codes do explain in detail how clay liners are to be joined, (NFPA 211 or IRC) both code bodies understand that the smallest hole can create a loss in performance when trying to exhaust smoke and gases from a fireplace or appliance. Gaps can create uncertainty, on how the fireplace or appliance will operate under all conditions. Smoke and gases can move into other areas within the chimney cavity creating more uncertainty. Remember you have a variety of solutions to stop the leaking, whether a chimney reline, resurface or joint repair. If you were wondering if gaps are a big deal, yes they are!! What the sweep is telling you! *Your chimney falls below recommended building codes. *If you’re asking “is it safe to use,” I can not offer you any peace of mind in it’s current condition. Todays technology and higher demands for efficiency and performance are now ramped up higher than before. So yesterdays thought process will not work with todays reality. Take a beverage straw and make a small hole in it. Place straw into beverage and draw on it. Once the beverage drops below the hole, there should be a sound coming from the straw plus you’ll work twice as hard to draw the beverage through the straw. This simple concept is the same with the chimney. 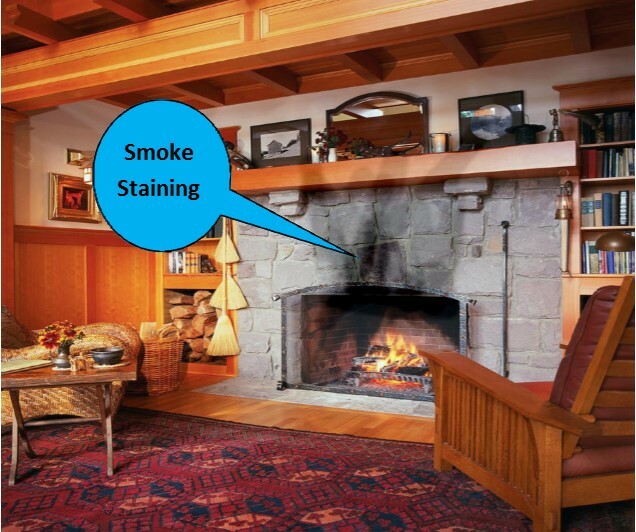 Now, do you understand why there’s smoke staining on the front of your fireplace?